The Safeguarding feature can help you with your organization's e-safety legislative responsibilities regarding Internet use. The Safeguarding report allows the you to run reports for various time periods to show any worrying website visits or search term usage. What is a Safeguarding Ruleset? Note the filter lists belonging to each ruleset are subject to change, and are constantly evolving. By default, the Safeguarding report opens with breaches from the Radicalisation ruleset, from yesterday. Valid options are: Today; Yesterday; the last calendar Week; the last calendar Month; the Previous 7 Days.  User (Group) — The username and authentication group of the user who made the breach. Users are listed in the order of breach level plus frequency of the breach, from the most severe and frequent breaches down to the least. • Danger — Red label; breaches with this level should be acted upon immediately. • Caution — Yellow label; you should take the necessary action with these breaches. • Advisory — Blue label; this level advises that a Safeguarding breach has been detected.  Reason — The matched categories from that user's breach or breaches. 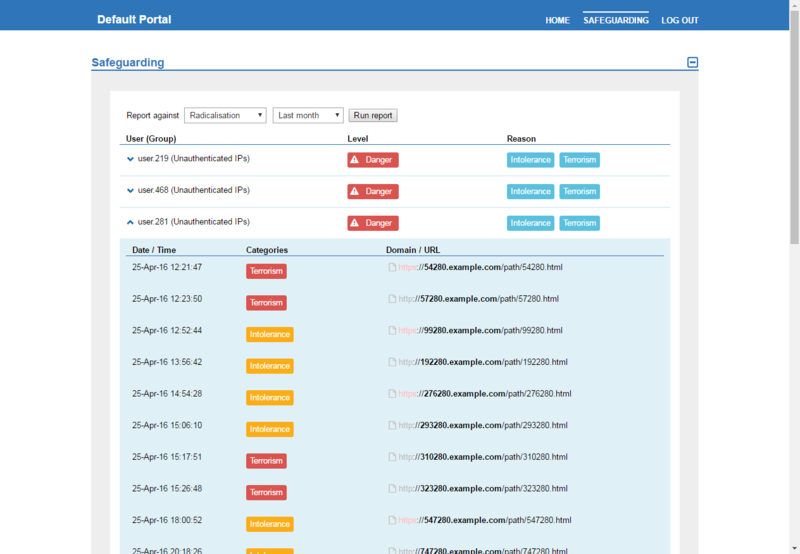 You can expand a user's entry in the Safeguarding report to view their breach history during the specified time period. 3. Filter the report as required — see Running the Safeguarding Report. 4. Click the down-arrow beside the relevant User (Group) name to view the user's breaches.  Date / Time — The date and time of the Safeguarding breach.  Categories — The filter category the visited site falls into.  Domain / URL — The full URL of the website that was visited.  Search term — If a search was requested to any categorized terms, the Search term column displays these, with the search engine used displayed in the Domain / URL column. You can expand a breach entry to view the full browsing history either side of the breach. This is particularly useful when understanding the context of the breach. 1. 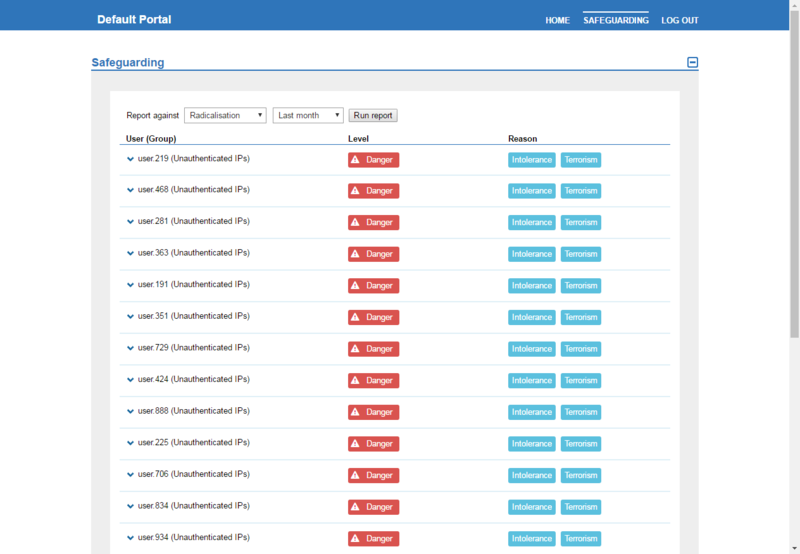 Run the Safeguarding report for a single user as detailed previously. 2. Within the expanded table, click the Date / Time entry to see further information about that particular Safeguarding breach. 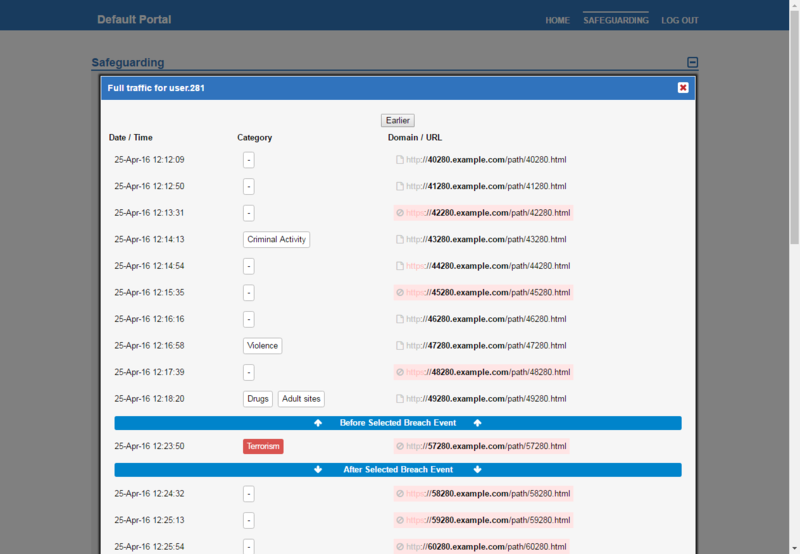 The selected breach is displayed in the middle of the Full traffic for <user> report, with sites visited listed above and below. 3. Use the Earlier and Later buttons to view more of the user's browsing history.  Date / Time — The date and time the website was browsed to.  Category — The category the website falls into.  Search term — If a search was requested to any categorized terms, these are shown here, with the search engine used displayed in the Domain column.